Over the past three years, Hubei Xingfa Chemicals Group Co Ltd has shut down about one-third of its production capacity as well as four chemical waste discharge flues along the Yangtze River. The moves are in line with government calls for improving ecological protection and cleaning up China's "mother river", which has faced severe environmental challenges in recent years. Central government bodies and provincial authorities along the river have been prioritizing the protection of the Yangtze since 2016, when President Xi Jinping highlighted environmental restoration and protection in and around the country's longest waterway. Li Guozhang, chairman of Hubei Xingfa Chemicals Group Co, said the company took the lead in shuttering plants near the river in 2016. He said that despite strong opposition from management, "we formed an understanding that lagging production capacity had to be eliminated and updated. The relocation was a challenge, but it was an opportunity if we grabbed the chance to upgrade our products." Three years after relocation projects began, the group has not laid off any employees but instead added 1,300 workers as its new operations－microelectronics and organic silicon－gained momentum, Li added. With an investment of about 2 billion yuan ($298 million), new business has taken up about 20 percent of Xingfa's overall operations. Xingfa is one of the petrochemical companies that shut down polluting production, and it has relocated production to new areas of Yichang, Hubei province, that are away from the river. The petrochemical industry has fueled strong growth in Yichang for years. Last year, Yichang achieved strong recovery, with GDP growth climbing to 7.7 percent from 2.4 percent in 2017. Its GDP reached more than 400 billion yuan. The transformation and update of traditional industries for a city like Yichang is a must, not an option, said Zhang Jiasheng, mayor of Yichang and a deputy to the National People's Congress, China's top legislature. "Only by taking initiatives will lagging industries have more opportunities," he said. Last year, the city continued its efforts to relocate petrochemical enterprises and close outdated production facilities. Two companies moved into industrial parks and three optimized their production structures. The city took the lead in the province in shutting down its coal mining industry, which had operated for about 200 years. This year, an additional four petrochemical companies will be closed, 18 will be updated and 14 relocated, Zhang said. The city government has set up a subsidy fund of 500 million yuan that from 2018 to 2020 is helping petrochemical companies relocate and optimize structures, with another 20 million yuan to develop technology to more efficiently extract phosphogypsum, the waste product of phosphorus-related production, to help reduce pollution. Innovations have stimulated the city's development and smoothed transformation to high-end and environmentally friendly industries, he added. The city has fostered biological medicine, electrical information, new materials and equipment manufacturing to drive its new economic growth. In 2018, the four sectors have taken up 38.1 percent of its industrial gross production value. Jiang Chaoliang, Party secretary of Hubei province and an NPC deputy, said Hubei has the longest stretch of the Yangtze, and is also home to the Three Gorges Dam, so a vibrant ecology and green development are top priorities in guiding the province to achieve high-quality development. In 2018, across the province, more than 100 petrochemical companies along the Yangtze were closed and relocated. 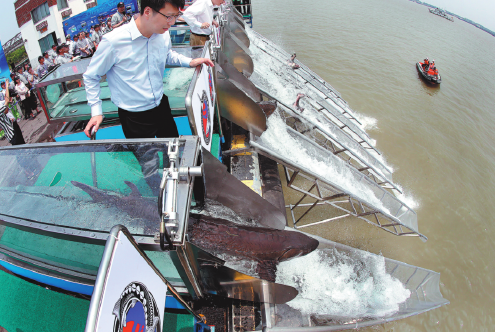 To better preserve the ecology along the Yangtze, a systematic and national-level management network integrating related government sectors should be established to plan, regulate and guide the process, said Niu Xinqiang, head of the Changjiang Institute of Survey, Planning, Design and Research. Overfishing and shipping have also contributed to the degradation of the fishing industry in the river, said Niu. Lack of proper waste disposal treatment is also a grave threat to the river. Cities along the river have to strengthen new infrastructure, better process sewage and enhance water conservation, he added.